Are there any sweeter words than art, music and dogs? Certainly those who have been involved with or have been the recipients of these types of therapies don’t think so. Let’s take a closer look at these unique therapy methods and examine the effects of each for those who need them most. Music therapy is a diverse set of practices where music is used to support people’s health, functioning and general wellbeing. Music therapists are university-trained professionals who work in major hospitals around Australia as well as aged care homes, early childhood centres and autism centres. They support people of any age, ability, background or culture, regardless of musical skill (or lack thereof). There are a number of case studies where music therapy has been used effectively with adults with disabilities, teens with mental health issues and in palliative care. Lady Cilento Children’s Hospital (LCCH) in Brisbane is one of the many major hospitals in Australia using music therapy. The vision is to provide world-class treatment to sick children in a healing environment, and music therapy plays an important role. With a large group of therapists to draw from, children are encouraged to make music, sing, write songs or simply listen to music during a hospital stay. Children often receive music therapy early during their stay at the hospital to help them relax, sleep more soundly and cope better with the unfamiliar ward environment. Mia Pearce was one such little girl. After falling ill on her second birthday, Mia was diagnosed with Acute Lymphoblastic Leukemia. She started her intensive treatment two days later at LCCH. The treatment must have been very frightening for the two-year-old, but Mia rarely let on. During times when she felt up to it, Mia would enjoy music therapy at the hospital. She would play in the Starlight Express Room, join in jam sessions with the volunteers, bang the drums or perform for her parents on the small stage set on one side of the room. Mia enjoyed music therapy and dancing which helped distract her from her treatment and give her the general creative play that a small girl needs. Music therapy is proven to increase health outcomes for children while in hospital and provides a useful tool for distraction from pain and anxiety. It provides an interest for children and can give them a sense of control. ‘Art’ and ‘prison’ are two words which are not often used in the same sentence. However, a pilot study has found that art therapy was effective at reducing depression among inmates. Prisoners often have a rigid set of defence mechanisms in place and are resistant to other therapies which rely on disclosure and conversation. Art therapy helps them overcome those obstacles and address symptoms associated with depression and anxiety. 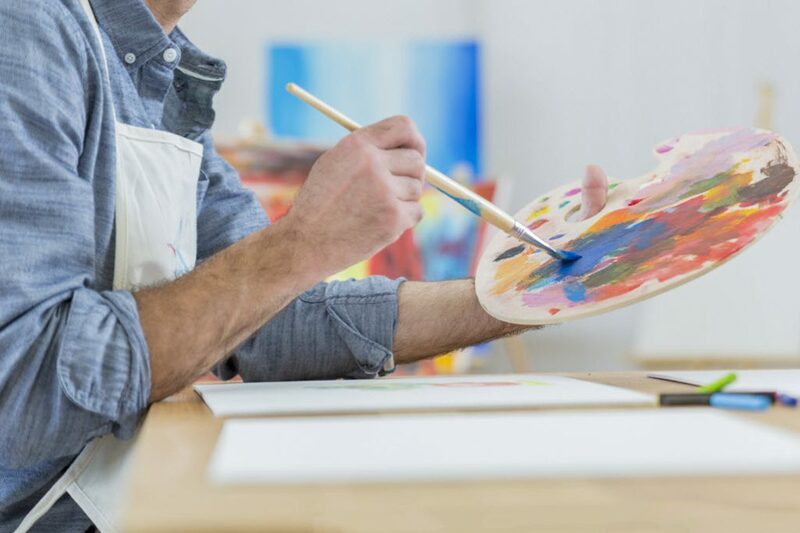 Art therapy is used widely and participants don’t need to be talented artists to enjoy its benefits and healing effects. People of any age or background can use art therapy to assist with a wide range of issues. The art itself can be any type of visual form such as painting, drawing or clay sculpting. WA Health is another strong advocate of art therapy as a way of allowing people to process difficult emotional issues and speed up mental health recovery. That’s the motto, Craig Gresham, founder of Misha’s Mates applies to the foundation. Misha’s Mates provide comfort and support to veterans and first responders who have often compromised their mental or physical health in service to their country or community. The Tasmania-based organisation empowers veterans to select and train their own assistance dogs as part of a treatment plan and facilitates adventure therapy, improving their lives beyond measure. Misha’s Mates started in 2015 after Craig Gresham adopted black labrador, Misha. Craig had realised the emotional and physical impact his 13 year stint in the Army had made, including three operational deployments to Timor Leste and two to Afghanistan. In his last overseas deployment he engaged in almost constant action, and the effects from losing friends had taken its toll. After returning to Australia, Craig was diagnosed with Post Traumatic Stress Disorder (PTSD) involving violent nightmares and high levels of anxiety, particularly in large crowds. When Craig sought out an assistance dog to help with this, he found Misha. But he quickly became frustrated by the lack of information and services available to train an assistance dog and have her assessed. Despite this, he persevered. Misha now takes her place at Craig’s side as his loving companion and qualified assistance dog. Soon after this, Craig was approached by other veterans asking for his support to train their own dogs, and Misha’s Mates was born. This organisation now offers assistance and support to those with physical disabilities as well as traumatic injuries like PTSD sustained by our soldiers and those in the emergency services. Due to Craig’s love of the Tasmanian wilderness, he then trained as as an Outdoor Recreation Facilitator. Now Craig and Misha also offer adventure therapy programs. These aim to provide mental health support from peers to those transitioning from military into civilian life. There is little doubt that music, art and dog therapies can have huge beneficial effects on some of our most vulnerable people. These therapies are proven to be effective for those who are in prison, veterans, sick children and anyone suffering from mental health challenges. So while it’s a well known fact that music soothes the soul, it seems that art and dogs may have similar positive effects.